I'm going to sound like a sommelier for a minute here, so my apologies in advance for the rant. But something has occurred right under our noses over the last five or so years: the hijacking of the pinot noir grape. If you've been drinking wine long enough, you may recall that pinot noir is that finicky, delicate, and most vulnerable of vinifera. The challenges it presents in the vineyard persist in the cellar where for centuries winemakers have been stymied to extract it's unique greatness. In its rare moments of brilliance, it is truly magnificent. But the vast majority of the time, pinot noir's lack of resilience results in thin, insipid plonk. Well, that used to be the case anyway. Modern winemaking styles, in California in particular, lean heavily towards richness, extraction, and, too often, high residual sugar. The result is that much of today's pinot noir is no longer thin nor insipid, but high-toned and syrupy (but still plonk). 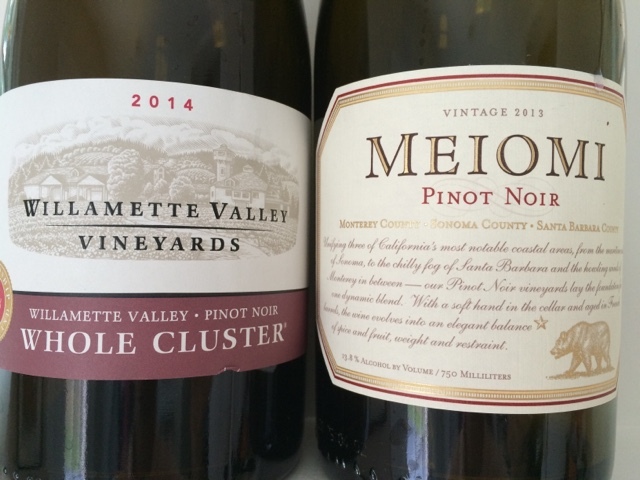 As an example of how pervasive this has become, I opened two very popular current release pinots: the ubiquitous Meiomi from California and Willamette Valley Vineyards Whole Cluster. Both wines cost $20. I expected cough syrup from the Meiomi, and restraint and bright acidity from the Orgenian contender. Both surprised. The Meiomi was large and extracted and dense in ways more commonly attributed to syrah, but it wasn't at all clumsy or flabby, and it actually had some structure. WVV's bottling, the 2012 vintage of which I appreciated last year (review here), was big, broadcasting Bing cherries through a megaphone with little in the way of acidity or, frankly, prettiness - a complete about face from the 2012. Both wines, though from vastly different regions, seem to have been designed by the same focus group. What these wines represent well, though, is a homogenization that seems to know no boundaries. Our Super Size Me appetites and palates raised on high fructose corn syrup help explain this popular trend. And pinot noir is not alone in being subjected to this treatment, nor is it isolated to US wines at all. The "international style" (which is sometimes referred to as the Parkerization of wine, but which could just as aptly be called the Texasization of wine) values largess, density, and swagger over all other qualities. The result is that fewer and fewer wines speak to us, so much as they yell at us. Am I reversing course and taking sides with Rajat Parr's outspoken stance that pinots should be quieter, gentler wines of nuance? No. Brash wines of substance and weight (even high alcohol) are appealing, so long as those components are delivered in balance. But you can't drink wines like that every day - they're just too much. Even the heartiest of us needs occasional refuge. Unfortunately, the popularity of this sub-woofer-driven wine trend is so pervasive that little domestic options remain - at least at the mere mortal end of the price spectrum. Thankfully, options abound in the Old World. For reds, look to Italy for schiava, cannonau, even some leaner Chiantis. For whites, France shines, especially in the Macconaise where the chardonnays will whisper to you if you let them. Long time reader, and first time poster( I'm imaging clanking metallic sounds, as well as bells and whistles) Anyway, I always enjoy the post, and I find them to be well written. I've been known to enjoy a bottle of Meiomi, and I think that it is nice for the price point. My problem, is that I hate the twist off cap, and feel that I am always selling/defending it to my friends for that reason. Convince me that I should embrace the twist off, or otherwise. It certainly loses the romantic quality of the cork popping!